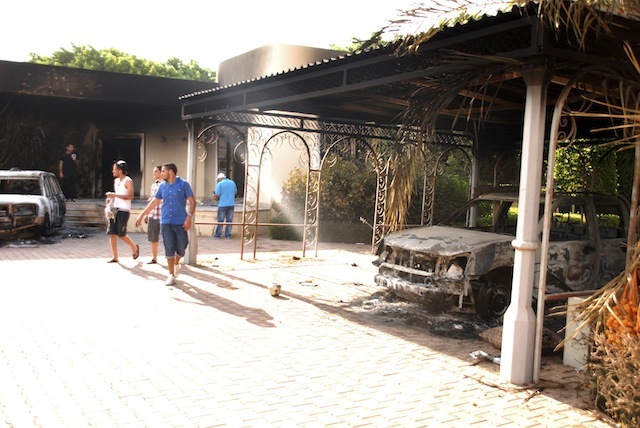 It was not a simple mob that attacked the U.S. consulate in Benghazi on Tuesday, killing four Americans. Benghazi was the scene of a pitched battle, one in which unknown Libyan assailants besieged American diplomats with small-arms fire for over four hours, repelling several attempts by U.S. personnel to regain control of it. Nor was what happened in Benghazi a simple story of Americans assaulted by the Libyans they helped to liberate from Moammar Gadhafi last year, American officials say. Libyan security forces and a sympathetic local militia helped the Americans to suppress the attack and get the diplomats inside to safety. That account is the first official telling of Tuesday’s events. It’s preliminary, as much of what has been initially reported in the media on Wednesday has proven incorrect. And it was provided to reporters late Wednesday afternoon by Obama administration officials who would not speak for the record. Now, a team of 50 Marines has arrived in Libya to secure the U.S. Embassy in Tripoli, where the Benghazi staff was ultimately evacuated. And Google is even assisting by blocking some access to a provocative, anti-Islam video that may have provided a pretext for the attacks. But all that comes too late for the Benghazi consulate, and for four Americans there who died, including the U.S. ambassador to Libya. Beginning at 4 p.m. Washington time on Tuesday, unknown Libyans began an assault on the group of buildings used by the State Department as a Benghazi consulate. That apparently took the consulate by surprise: The diplomats there received no indication of an attack brewing when it reviewed its security posture ahead of Tuesday’s 9/11 anniversary. The compound lacked a Marine guard force, as is present at U.S. embassies in foreign capitals. Nor did it have other typical diplomatic security features, such as bulletproof glass and reinforced doors. Libyan guards were said to be outside the walls providing an outer layer of security, with a State Department security detail of undisclosed size within. The attack, with small arms fire, set the main building aflame with three people inside, including Amb. Christopher Stevens. A consular official responsible for securing the complex, who initially left the building to escape the flames and thick smoke, found information-management officer and gamer Sean Smith dead inside. A still-unknown number of American security personnel, dodging small arms fire and flame, attempted unsuccessfully to regain control of the main building 45 minutes after the attack began, retreating to an adjacent building annex. By 5:20 p.m. Washington time, Libyan security forces, assisted by what was described as a sympathetic local militia, regained control of the main building, and assisted an evacuation of the staff of approximately 25 to 30 to the annex. But by 6 p.m., the assailants began to attack the annex with small arms fire. It was there that two other, as-yet-unidentified U.S. nationals died. It was not until 8:30 p.m. D.C. time that the attack was suppressed. But the security forces had lost track of Stevens. Administration officials said that Libyans transferred Stevens to a Benghazi hospital at some point during the fighting. It is unknown if he was dead or alive when he reached the hospital, or what ultimately killed him. His body was ultimately transferred to American personnel at Benghazi airport, where a chartered U.S. flight was called in to evacuate the Benghazi diplomatic staff to the embassy in Tripoli. All told, four U.S. nationals are dead and another three are wounded; it is not believed, contrary to early media reports, that any are U.S. Marines. The wounded and dead have been taken to American military hospitals in Germany, and the human remains will be taken back to the United States. The Associated Press appears to have tracked down “Bacile.” He is 55 year-old Nakoula Basseley Nakoula, a convicted fraudster who was sentenced in 2010 to 21 months in federal prison. He was also ordered to pay $790,000 in fines, and told not to use computers or the internet for five years without his probation officer’s okay. The anti-Islam Florida pastor Terry Jones is said not to be involved in the film, but Army Gen. Martin Dempsey, the chairman of the Joint Chiefs of Staff, called Jones this morning to persuade him to revoke support for the film. Google is taking another step. Bloomberg reported that Google will not remove a 14-minute clip from the film available on YouTube, as a YouTube statement said the clip was “clearly within our guidelines.” But it will restrict access to the film on YouTube in Egypt and Libya. Reuters reported that the Afghanistan government has already blocked YouTube access to prevent any potential provocation inside that country. Administration officials have said they have not yet received indications that Afghanistan, which has already experienced riots ostensibly motivated by affronts to Islam, will soon experience related attacks. But U.S. embassy personnel worldwide have been told to beef up their security as they see fit as a precaution. For now, in Libya, a Marine Fleet Anti-terrorism Security Team or FAST team has the mission to secure the embassy in Tripoli and to assist with any necessary evacuations of U.S. personnel out of Libya. Based out of Rota, Spain, it will not assist in a hunt for the perpetrators of Tuesday’s attack that President Obama has promised will occur. Defense Department personnel have not, as yet, addressed the composition of that force. Much of it is likely to fall within the command of Army. Gen. Carter Ham, the commander of U.S. troops in Africa. American drones and other military intelligence assets, some of which may not be under Ham’s command, are also likely to be used. Which means the next battle of Benghazi could be even more intense than the last.